The heart and the head sometimes go in different directions, and they do for me today as Iranians go to the polls to vote in their country's semi-legitimate presidential elections. Many problems afflict those elections – including restrictions on who may run for president, what issues may be discussed, and the accuracy of electoral results – but the most important limitation concerns the powers of the president, who is conspicuously not the country's most powerful politician. With two important exceptions, the rahbar equals the president-for-life (such as Egypt's Husni Mubarak) or king-for-life (such as Jordan's Abdullah II), while the Iranian president equals their flunky prime ministers. The exceptions explains why the Iranian president is much better known than his functional equivalents: he is directly elected and the rahbar, in keeping with his religious character, stays aloof from overt politics. Together, these two factors account for the anomaly of the Iranian president serving as the public face for a regime he does not control. This means that whoever is elected president, whether Mahmoud Ahmadinejad or his main opponent, Mir Hossein Mousavi, will have limited impact on the issue that most concerns the outside world – Iran's drive to build nuclear weapons, which Khamene'i will presumably continue apace, as he has in prior decades. Therefore, while my heart goes out to the many Iranians who desperately want the vile Ahmadinejad out of power, my head tells me it's best that he remain in office. When Mohammed Khatami was president, his sweet words lulled many people into complacency, even as the nuclear weapons program developed on his watch. If the patterns remain unchanged, better to have a bellicose, apocalyptic, in-your-face Ahmadinejad who scares the world than a sweet-talking Mousavi who again lulls it to sleep, even as thousands of centrifuges whir away. And so, despite myself, I am rooting for Ahmadinejad. 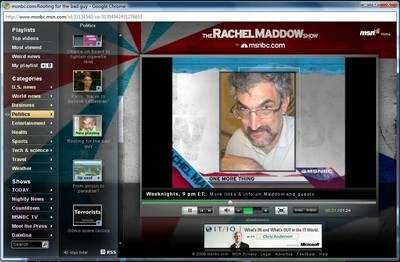 Daniel Pipes on MSNBC's Rachel Maddow Show.